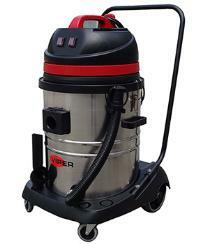 The VIPER LSU 255 is a wet/dry professional vacuum cleaner. It is easy to use, robust and has optimal suction power. LSU product family has a modular design with different tank capacities and motor quantities.Tank capacity for LSU 255 is 55 litres and it has two motors.You can choose stainless steel tank or red plastic tank. You can easily see whether the tank is full of water or not if the tank is made of translucent plastic. It has a drain hose mounted and you can easily empty the tank without taking off the motor.It has large rear wheels and rotating front wheels which makes it light and easy to maneuver.As standard, the machine is delivered with the following accessories: crevice tool, round dusting brush, wet pick-up tool and dry pick-up tool.